Identification: Wings are bright yellow-orange. 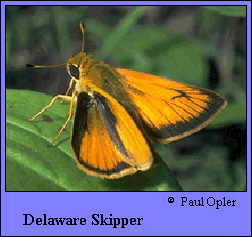 Upperside has black borders and black veins near the margins; forewing has a black bar at the end of the cell. Females have wider borders and darker markings than males. Underside has no markings but may have darker orange veins. Life history: Males perch within 1 1/2 feet of the ground in open, grassy areas or along streams to await receptive females. Females deposit eggs singly on host plant leaves. Caterpillars eat leaves and use them to make nests. Flight: One brood from July-August in the north; two broods from May-September in the south; several broods from February-October in Florida. Caterpillar hosts: Various grasses including big bluestem (Andropogon gerardi), switchgrass (Panicum virgatum), and wooly beard grass (Erianthus divaricatus). Adult food: Nectar from pink and white flowers including swamp and common milkweeds, shrub houstonia, mountain mint, marsh fleabane, sweet pepperbush, buttonbush, thistles, and pickerelweed. Habitat: Moist areas including marshes, prairies, fields, roadsides, suburban yards.